Whenever I think about Etude House, I always think about Sweet 16 girls, meaning, teenage girls who are using this just to look sweet and, well, young! I find that I'm too old for these types of glittery and shiny makeup! It was a decade ago when I started out doing makeup looks online from bright purples to blues and greens! You name all the shadow shades, I've probably done them all! With the arrival of Etude House's Be My Universe launched last Holiday, I actually purchased this in store even before launching for the mere fact that it has a Planet Saturn printed on the palette which reminds me so much of my son! The Etude House Multi Palette comes in 2 shades - Pinky Galaxy (contains cool tone shades) and Golden Galaxy (contains warm tone shades). I personally wanted the Golden Galaxy but I opted for shades that I don't have much! Out of all the planets, I don't know why they picked Saturn, must be because it is the most beautiful planet as it comes with rings? Okay, I'm too scientific here, blame my son guys! Comes with expiration date and 2020 is a great year! I personally think the Golden Galaxy are more pigmented but I fell in love with the Taupe shade included in the Pinky Galaxy and I made the right decision picking it as it is a perfect contour shade for both my eyes and nose! This is just ONE of the MANY ways I an use this palette to create a Sweet Look that is still okay enough for all ages! Using the taupe color (not photographed), I applied it all over my crease for depth. Picking the shimmery maroon shade, I apply it on the outer corner of my eyes blending inwards. Because I plan to feature a very simple sweet look yet can be done in less than 5 minutes, I use my fingers in applying the shimmer pink color at the center of my lid for a subtle "halo effect". Highlight the brow bone using the lightest shade on palette, ths is almost white so be careful not to use too much! The key to a perfect highlight is to use product sparingly. With the pink champagne (glitter) shade highlight the inner corners of the eyes. Using a big powder blush, apply the blush shade on the apples of your cheeks, this shade is very subtle so it also appears as a great highlighting color. In most Sweet Looks created, it is very easy to go overboard just because you are aiming for the product to show up on photos! As for me, a real sweet look is a look that doesn't look like you have a lot of makeup on but it helps enhance key features of your face! Check out the hint of blush pink on both the eyes and cheeks. Just so not to contradict the sweet look, do not apply heavy eyeliner! Now, here's a trick, since this palette do not contain any lip color, I apply a hefty amount of lipbalm and gently dab the cheek color on top of the balm to create my own lip color! 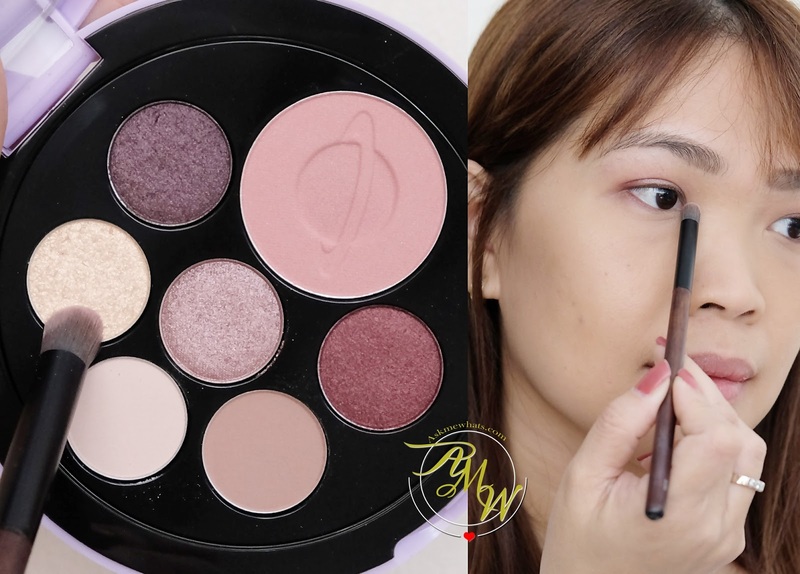 Again there are so many ways to apply makeup using this palette. I can go for nighttime look by darkening the shadow colors (all shadow shades are buildable). They can also work with eyeprimer underneath just for the shadows to appear more vibrant! Do you like the Limited Edition Be My Universe Multi Palette from Etude House? The blush shadw is so gorgeous. The packaging is so cute just like Tarte's round palette and the shades are pretty too!